Baby Safe Sleeping Tips - Which? Check up on the correct temperature, clothing, bedding and safe sleeping position for your baby at bedtime. 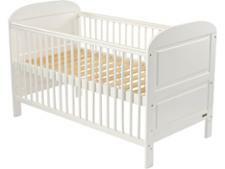 Choosing the right cot bed is your first step when it comes to safe sleeping for your baby. When we test cot beds we ensure that they comply with British Standards, and that they're durable and easy to assemble, so reducing the risk of your cot bed being put together incorrectly and therefore putting your baby at risk. 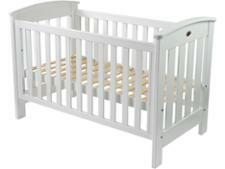 Take a look at our cot bed reviews to find out which ones made the grade to become Best Buy cot beds. The safest position for your baby to sleep in a cot is on his or her back, not front or side (unless your doctor advises otherwise), until your baby is able to roll from back to front and back again. 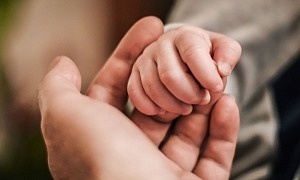 Place your baby with feet to the foot of the cot, so he or she can’t wriggle down under the covers. Don’t worry if he or she wriggles up and gets uncovered. Alternatively, you can use a baby sleeping bag instead of bedding. Make sure the mattress is firm, dry and clean – read our guide to cot mattresses for more information. Take a look at our full guide to baby bedding for more information on what is best to use. Babies need to lose excess heat from their heads, so remove hats and extra clothing from a sleeping baby as soon as you come indoors or enter a warm bus, train or shop, even if it means waking your baby. Keep the cot out of direct sunlight. Some research has shown that using a dummy every time you settle your baby to sleep can reduce the risk of cot death. 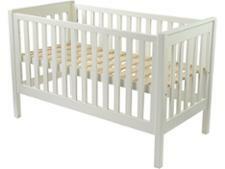 How to buy the best cot bed – we give you expert advice and essential tips to choose the best. 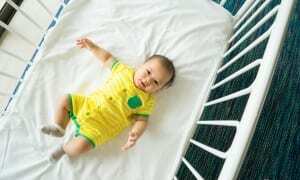 In October 2017, several prominent retailers (Mothercare, Tesco, John Lewis and eBay) stopped selling baby sleep positioners for babies under six months, citing concerns over safety. These products pose a risk of suffocation if the baby rolls onto its front, and there have been 12 infant deaths in the US between 1997 and 2010 due to this. The Food and Drug Administration (FDA) in the US released a statement warning about these items, which are also known as 'anti-roll' products, warning parents not to buy them or use them. Which? doesn't review these products and current safe sleeping advice from The Lullaby Trust is that cots should be kept clear of pillows, toys, bumpers and sleep positioners, because the evidence shows that this reduces the risk of sudden infant death syndrome (SIDS).